Hey, remember when I praised Daredevil for avoiding the trope of fridging a female character in order to prove the villainy of one man and motivate the villainy of another? Well consider this my primal scream that “Upstairs/Downstairs” goes ahead and undoes that in the cheapest, laziest, most unnecessary way possible. To quote Dex, “AHHHHHHHHHHH!” What’s even worse than the fact that Daredevil treats Julie’s truly horrific death like it’s a clever bit of action is the fact that there’s literally no reason it needs to happen. We already saw Dex hit his lowest emotional point, embrace Fisk’s philosophy, and then brutally murder a bunch of people as Faux Daredevil. I’m sold on the idea that he’s an incredibly evil dude (again, watching someone BRUTALLY MURDER INNOCENT PEOPLE tends to do that). I don’t need a follow-up episode meditating on the complexity of his morality. Yet despite hitting the same beats as “The Devil You Know” but less well and more problematically, “Upstairs/Downstairs” expects us to be shocked and moved when Dex winds up in the exact same place he was the last time we saw him. After the big Daredevil vs. Daredevil fight of “The Devil You Know,” it definitely feels like this season is stalling for time. I wouldn’t dismiss these past two episodes as just filler, because I’ve liked some of the character developments that have happened within them. But they feel like episodes where Daredevil is focusing on plot over theme, and I tend to care about the latter way more than the former, at least on this show. The most plot-focused element of this episode sees Nadeem and Matt team to investigate Dex. We get a little tension about Nadeem wanting to go about things through legal (or at least semi-legal) channels while Matt wants to take out Dex vigilante-style. But for the most part, it’s a storyline that’s more interested in the procedure of their investigation than in exploring anything it has to say about the characters involved. It’s also an excuse for the show to offer an action scene where Dex ricochets bullets and tosses chandelier crystals. It’s not a bad action sequence, but it mostly made me realize how little justification Daredevil has offered for Dex’s proclivity for just, like, throwing things at people. It’s such a bizarre thing for a gun-wielding person in this relatively grounded world to do, especially when he doesn’t carry around things to throw but just relies on whatever’s around him. What elevates this episode above the previous one, however, is Karen’s unexpected tête-à-tête with Wilson Fisk, which ultimately feels far more visceral and compelling than the Bullseye action scene. Karen’s been saddled with some boring investigative plots this season but she finally gets a chance to shine here. 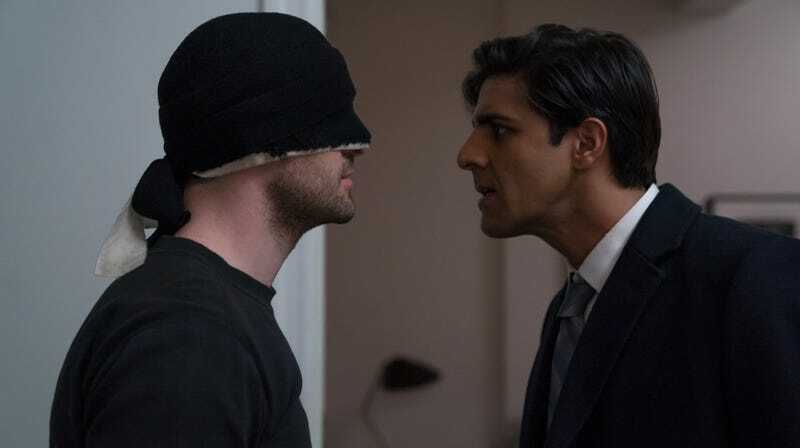 Having been fired from the Bulletin for refusing to reveal Daredevil’s identity, Karen decides to go rogue and try to provoke Fisk into attacking her, thereby forcing the FBI to send him back to prison. She finagles her way into his penthouse and needles him with everything she can think of—first by discussing how she and Ben Ulrich spoke to his mom, then by explaining that she knows he murdered his dad, and finally by revealing that she murdered his erstwhile best friend James Wesley. 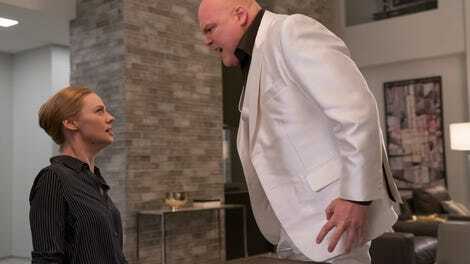 Fisk, meanwhile, gets his own upper hand moment when he gets Karen to wordlessly confirm that Matt Murdock is Daredevil. Paired with Vincent D’Onofrio and on the heels of that great phone call scene in the previous episode, Deborah Ann Woll turns in her best performance yet in the Fisk confrontation. Much of this season has been about juxtaposing Matt, Dex, and Fisk as three men whose lonely, troubled childhoods gave them the capacity for violence and impulsive risk-taking. It turns out Karen might be a fourth point in that portrait of disaffected, unmoored people. Like Dex and Matt, she has very little in the way of structure or support around her, especially now that she’s lost her job and her friendship with Ellison. I’ve been referring to Dex as this season’s wildcard character, but Karen might be an even bigger one. In terms of other wildcard surprises: Sister Maggie is Matt’s biological mom! Given this is a storyline from the comics, I suspected we were in for this reveal eventually, so I wasn’t particularly shocked when it happened. (I’d be curious to hear how the reveal landed for those who didn’t know it was coming.) I’m intrigued by the storytelling possibility it opens up for the rest of the season and anything that puts the focus back on Matt and Maggie’s relationship is good in my book. But I found the moment of the reveal itself—which involved Maggie praying aloud to Jack to protect their son and Matt overhearing her—to be kind of goofy. At the very least, however, it’s nice to see Daredevil moving its story forward again, even if it’s doing so by looking to the past. This is a really good Karen episode, but at one point she refers to herself as a “trained journalist” and I have to call shenanigans on that one. I didn’t really care for Foggy’s public grandstanding against Blake Tower, but I did love when he left in the middle of his speech to go help Karen. I really miss the days when Daredevil centered on Matt, Foggy, and Karen’s friendship, and I hope the show gets back to that dynamic soon. Foggy has figured out that Fisk’s big plan is to strategically give the FBI information on his criminal rivals as well as any other criminals whose absence would create a power vacuum he can fill. It doesn’t really feel like much of a reveal. I love the detail that Matt is a master safe cracker. It’s a natural use of his abilities, but one I’d never thought about before. It was also fun to experience Matt’s impressive skillset through the fresh eyes of Nadeem. Why the hell is Nadeem sitting in his car patching up a bullet wound instead of going to a hospital?! ?